Andrew Mitrak — I read 43 books in 2017. These are my top 10. I read 43 books in 2017. These are my top 10. At the end of 2016, I felt I squandered too much of my time on bite-size internet content: tweets, headlines, memes, and blogs. These give short-term gratification, but leave me feeling empty. They harm my ability to focus. Ultimately, they’re forgettable. Can you remember a Facebook post you saw four days ago? I can’t. 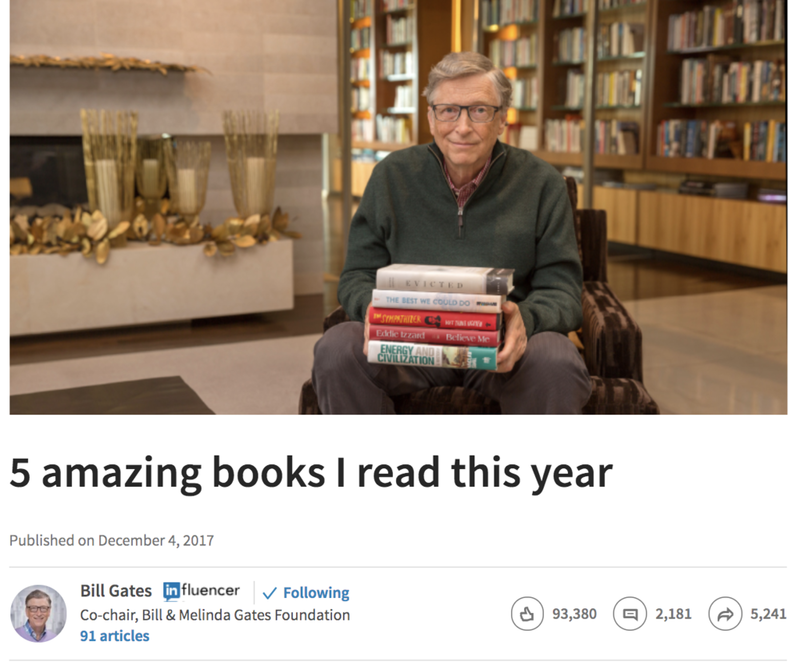 If Bill Gates can find time to read books, so can you. Unlike browsing the internet , reading a book elicits a compounding effect. It’s not a scattered experience. Each paragraph upon a narrative, argument, or idea. Books force me to ignore the temptation of my iPhone, thereby improving my ability to focus. Books are memorable. I have much stronger recall of information that I read in a book compared to something I read on my Facebook feed. 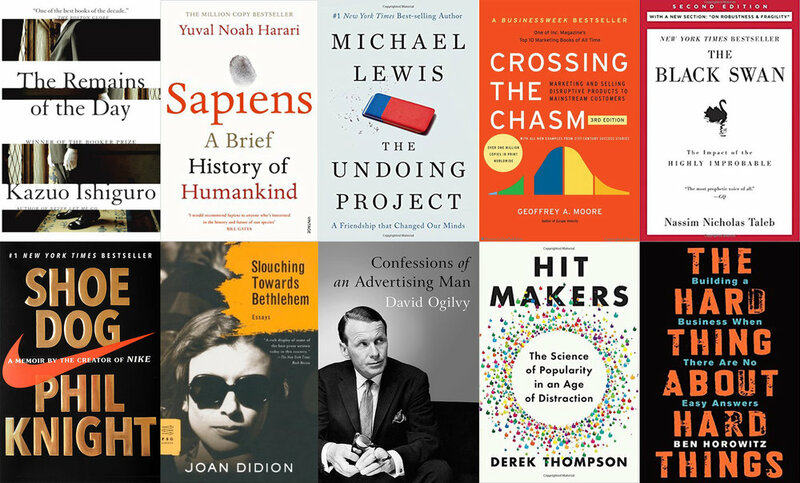 Inspired by avid readers like Bill Gates and Mark Zuckerberg, I set a goal of reading 50 books for 2017. I wound up reading 43. While I’m somewhat disappointed I didn’t make it to 50, I’m proud of the volume that I read and the habit that I formed. I can categorize my nights into two kinds: nights that I read and sleep like a baby and nights that I don’t and I toss and turn. Since adopting a nightly reading habit, I’ve never slept better in my adult life. People love talking about their favorite books. I keep an ongoing list of books I want to read on my phone’s Notes app. When someone talks about a good one they’ve read recently, I add it to my list. This is a win-win. I get new book recommendations. The person I’m talking to feels flattered that I added their recommendation to my list. I read before bed and on bus commutes. These are times I would typically be on my phone. I can’t otherwise use this time to be productive. Seattle has a wonderful library system. I love the tactile feeling of a physical book. It’s encouraging to see how many pages I have left in the book before I finish. Borrowing a book motivates me to read to completion before the due date. The best part: it’s free. This reminded me of how I should measure my life. This taught me how fiction and myth are the glue that connects humankind. This showed me the extent of human irrationality, and the brilliant ideas that come through collaboration. This taught me how to frame B2B go-to-market strategy as a leader in an early-stage technology company. This reinforced my skepticism of so-called experts and forecasters, and showed me the benefits of zigging while everyone else zags. This is a sheer delight. It showed me the long slog of one of the world’s most iconic brands: Nike. This shed light into the dark side of the counterculture movement in 1960s California, an era that endlessly fascinates me. This drove home the concept of the “familiar surprise” and MAYA (Most Advanced Yet Acceptable) as frameworks for creating compelling content. Every one of the books on my top ten list was recommended to me by someone. I plan to maintain my reading habits in the coming years, and am always looking for new suggestions.